I promised to write to you before your going to College, and though much pressed with work on every side, my dear boys, who have been so long under my roof, and with whom I have so often knelt in prayer together at the throne of grace, have prior claims. You know I write in the fullness of love. I trust that you have both now acquired habits of study, and a real love for the acquisition of useful knowledge; and these will be very important, and should be carefully cultivated; both as leading to great means of usefulness hereafter, and as being a present preservative from the many peculiar snares and temptations of being thrown so much on your own free choice as to the employment of your time. You are at present but little acquainted,—you can be but little acquainted, with your chief danger, your own hearts. I have had about forty years’ more experience than you can possibly have on this point, and be assured, my dearest children, here is your chief temptation. You know not, you cannot know, what power the lust of the flesh, the lust of the eye, and the pride of life, have to lead you astray from the paths of safety and of holy happiness. The tremendous snares of self-confidence, self-sufficiency, vanity and self-will, beset us on every side. The great preservative is the love of God in Christ Jesus, shed abroad in our hearts by the Holy Spirit. What fallen creatures must we be, when nothing but our Creator’s appearing in our flesh and blood, and dying for us, could reconcile us to God! Let us then cease to place any confidence in ourselves, and place all our trust only in the Lord! Your first, therefore, your great, your chief attention, must be fixed on your own hearts. 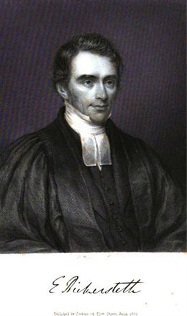 “Keep thy heart with all diligence, for out of it are the issues of life.” Let the care of the soul be with you “the one thing needful.” Neglect not, on any consideration, private prayer, at least morning and evening, and reading daily in secret, in regular order, and with earnest prayer, the Holy Scriptures. Next to this, my beloved children, I would earnestly press upon you an entire separation of the Sabbath to its sacred duties. Let it not be a day of visiting, or of receiving visits. Let it not be a day of studies, excepting those which are strictly religious and devout. Abundance of books you both have, besides the Holy Scriptures, that may employ all the leisure hours of the Sabbath. Attend that public ministry that you judge most spiritual, and suited to profit you, and do not change about, but remain under the same ministry. If you can, secure perfect retirement and quiet, for meditation, self-examination, and devotion, during one part of the Sabbath-day. Remember your health of body, as well as your spiritual health. Every day give a good portion of time to exercise in the open air. You will gain by it in the end, and your strength will be unbroken for future usefulness. Do not indulge in late hours, but have a well regulated plan of rising, study, and going early to rest; and keep to it. Many temptations will be avoided by attention to these things begun at once ; and especially by letting it be known, from the first, that you mean to be a student and a Christian, and will not be drawn aside from a course consistent with such a profession. Oh be not ashamed of the gospel of Christ! Disregard the laughter and ridicule of the world. The choice of friends, in so great an assembly of the young, will have a material influence on your conduct at College. The great Scripture principle is, “I am a companion of them that fear Thee.” The first verse of the first Psalm makes plain to us what we should avoid. . . . A steady course of conduct, constant regularity in studies, and consistency in your principles, will secure to you the friends best worth having, and whose friendship will be a joy to you all through life. Never mingle in the society of others, without striving to speak a word for God and His truth, and to do some spiritual good to those with whom you associate. Expensive habits ought on every account to be avoided. They are more injurious to yourselves than even to your parents. . . . Have no debts that you can possibly avoid. . . . I trust you will seek to excel, by diligence and patient application, in the appropriate studies of the University. Your parents and friends will rejoice in any success you may attain in those studies. But let the chief motive to diligence be—it is a duty to your heavenly Father. He is present with you at all times. His favour follows all who seek to please Him in a faithful discharge of appointed work, and His favour is better than life itself. These are the hints it has seemed to me most important to give you. . . .
You are also responsible before God, in having heard so much truth as you have heard for so many years, and having been the subject of so many prayers and hopes. Oh may you, in this great trial of your character, be steadfast and immoveable! . . .